Makerfaire NC was a blast! 757Labs manned a table near some other great groups including other hackerspaces, the wonderful Techshop RDU, Shopbot and others. In one year it's amazing how much the event has grown and how the attendance was solid ALL day. There never was a break. Our RockBand Drum Circle was on beta test display, as was Kyle's LED cube and the Hackerspaces in Space space balloon bits. All in all a great time. Thanks to Makerfaire NC for having us and Hines Design Labs for spreading the word to us! Thanks to all the lab members that helped out! David, Jack and I (Ethan) also visited Techshop RDU on Friday evening. A 20,000 square foot space with every tool and resource you can think of! I knew of Techshop but had no idea how stacked it was with equipment and resources. We met some Hampton Roads locals who had traveled down to Raleigh for the event. 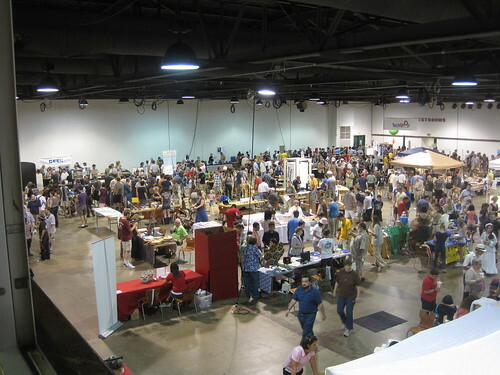 Do you think a mini Makerfaire would be possible here in Hampton Roads? Opposite time of the year from Raleigh and supportive of their event? Sorry we've been slow updating the blog. There is a bunch of stuff coming rapidly. This is one of many posts coming. In November the lab had a visitor from the Netherlands who did a tour of hackerspaces around America. He did an interview of some 757 Labs members and spoke about it on his podcast. You can listen here. More info here..
We've got visitors coming in Febrary from Michigan to check out our space. They are bringing an interesting project. 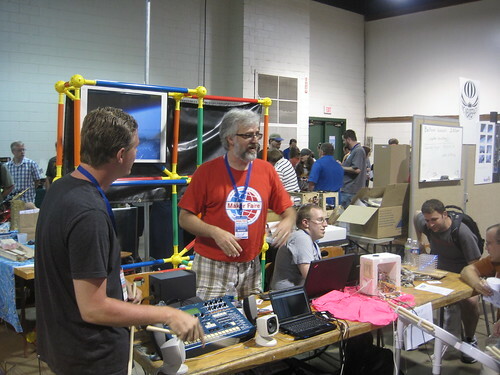 June 18th is Maker Faire in NC at the State Fairgrounds. 757 Labs plans to be there representing Hampton Roads! If you have ideas of projects to build or bring, let's talk!